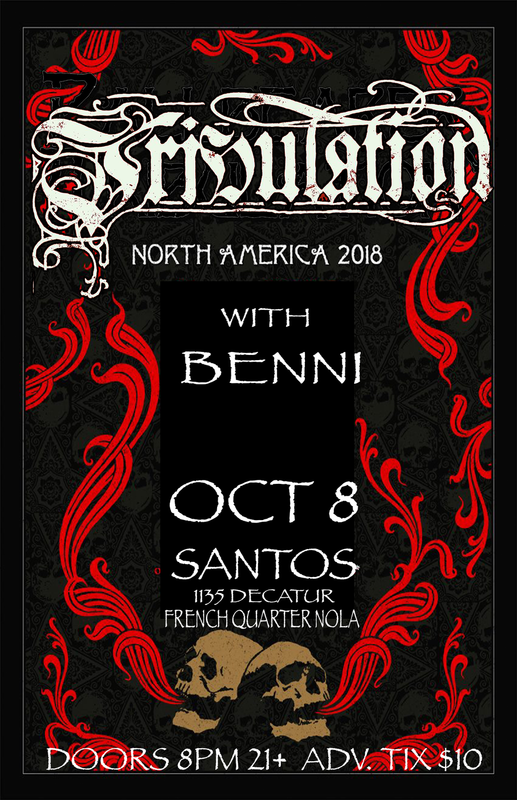 Emerging from the darkness of the Swedish death metal abyss in 2004, Tribulation has stood apart from what was already a crowded scene, betraying an uncompromising vision that refused to be shackled by any genre stereotypes. Down Below was recorded at Soundtrade Studios and Studio Cobra, respectively. Soundtrade, renowned for hosting Swedish music legends ABBA, Yngwie Malmsteen, and Europe, is where Leander tracked the drums with Martin Ehrencrona (Vampire, The Oath) at the helm and Linus Björklund at his side. After the Soundtrade sessions were over—about a week, according to Zaars—Tribulation cut over to Studio Cobra, with Ehrencrona in tow, to record the bass, guitar, vocals, and other instruments. For three months the Swedes toiled into the dead of countless nights—where songs like ‘The Lament,’ ‘Lady Death,’ ‘Lacrimosa,’ and ‘Here Be Dragons’ invoked the vaults of heaven to remarkable effect—to realize Down Below. Harvest, however unpleasant, was positively plentiful. “We chose Cobra because we recorded some stuff there for Children and really enjoyed the time there,” Zaars says. “Both the time in Soundtrade and Cobra were very enjoyable. Cobra and Martin gave us the opportunity to be creative. It was a new experience for us to work with a producer as we have this time, and I think we all really enjoyed it. I left a few things unfinished in some of my songs so that we could have his input and he’s been giving input and ideas wherever and whenever he’s had some. 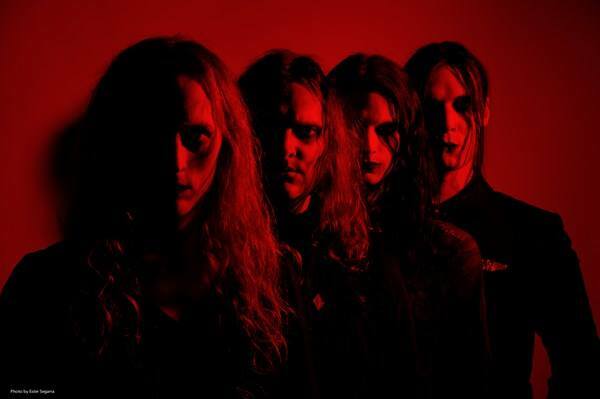 You give and you take and you kill a lot of your darlings, but in the end that’s almost always a good thing, and this time it really elevated the songs.” Certainly, Tribulation have come away with an album full of gems. From the death-rock shake of ‘The Lament’ and the windy Carpathian haunts of ‘Subterranea’ to the gloomy post-punk of ‘Nightbound’ and the infectious refrains of ‘Here Be Dragons,’ Down Below is unbelievably great. But it doesn’t stop there. Inside the songs, Tribulation parlay awe and shock into something more impressive. Some of Zaars and Hultén’s best solo work can be heard on ‘Lady Death,’ ‘Cries from the Underworld,’ and ‘The World.’ Time-keeper Leander has also proven himself worthy of his newly appointed position. His ability to play simple yet clever continuously gets better as Down Below progresses. Check out ‘Here Be Dragons’! And Andersson’s vocals—even in their sublime decay—emote heavy sheaves of hate, mourning, loss, and fear. If The Formulas of Death was arboreal and The Children of the Night urban, then Down Below must be nestled in between. “A bit of both for sure,” says Zaars. “We were aiming in one direction that was a bit more foresty and that direction kind of made its own twists and turns, as it always is when we do something. We let it happen, we let it guide us. When we speak in terms like this I would say that it’s still somewhat in the city, but that city is much older, or in a different era, than the city that Childrenresided in. And it’s a lot closer to the forest, and even ventures quite deep into it.” Changes are inevitable. The force of momentum powerful. As with The Children of the Night, so too with Down Below. Tribulation has succumbed to change and momentum, but the Swedes didn’t let it become them. They’ve evolved (or are evolving) on Down Below. To wit, the evocative vibe of places frightful and things malign remains strong, as does Tribulation’s roots as an inspired death metal act. What’s changed is the approach and the inspirations affecting the approach. Down Below isn’t just Album of the Year material, it’s the type of effort that will be remembered for decades. Music from the other, indeed!